Welcome back to our series, Common Scents! 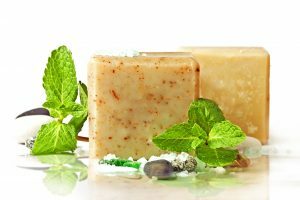 Common Scents is a collection of articles exploring the history of commonly used essential oils, and how they became so popular in modern day soap and cosmetic crafting. This week, we’ll talk about peppermint! Peppermint is one of the most recognizable scents in existence. Its strong, refreshing scent elicits thoughts of winter, chilly weather, or peppermint candies. This pungent oil is very versatile, and much like the other scents we have covered, it has a rich and exciting history behind its use in modern day products. Peppermint is a perennial aromatic herb, and grows in the summertime, although it can be cultivated indoors through the winter. It requires a moist growing environment, and is common in Europe and North America. Peppermint oil contains menthol, which gives it its signature cooling sensation and refreshing scent. Peppermint, also known as Mentha piperita, is a naturally occurring hybrid of Mentha spicata (spearmint) and Mentha aquatic (watermint). The word mentha is believed to come from a scandalous love triangle involving two Greek deities and a nymph. As the story goes, Hades (Greek god of the underworld) and Persephone (daughter of Zeus, and the queen of the underworld) were husband and wife. Hades developed feelings for a water nymph named Minthe (also referred to as Menthe). Persephone caught them, and turned Minthe into a small, unassuming plant that would be easily trampled upon, but Hades took pity on Minthe; he was believed to have given her a minty fragrance, the same one that the plant emits today so that those who smelled the scent would be reminded of her beauty and vigor. Aside from a mythical Greek soap opera, peppermint itself has quite a long history both in medicinal and cosmetic use. Let’s start with Pliny the Elder, a Roman naturalist who documented the culinary use of peppermint in flavoring wine and sauces as early as 23-79 CE. Pliny also wrote that Romans would use peppermint as accessories with their outfits and as decorations on their tables during banquets. The Romans also used peppermint to aid in digestion, and were said to use it as a ground cover so that the paths they walked would emit a pleasant smell. The Egyptians also held peppermint in high regard, so much so that dried peppermint leaves have been discovered in the pyramids. It is mentioned in the ancient Egyptian medical text, Ebers Papyrus as being used to calm stomach pains, a common use for the plant. Peppermint is mentioned in the 13th century Icelandic Pharmacopoeias, but was not used widely for medicinal purposes until its first recorded cultivation in the mid-1700s in London. Listed in the London Pharmacopoeia, peppermint was distinguished as a remedy for everything from sores to headaches. Its rising popularity meant that cultivating land went from just a few small acres to several hundred in a very short period of time. Native Americans have been using different kinds of mint for centuries as medicinal herbs. When European settlers arrived in America, they introduced peppermint to the Native Americans, which encouraged the cultivation of the herb in North America. Please keep in mind that these claims have not been approved by the FDA, and, as with all of our Common Scents articles, the HSCG does not encourage nor advocate the use of peppermint to treat these conditions. Always consult a medical professional before starting a preventative or curative treatment. Today, we use peppermint for a wide variety of common household items. Things that you use daily likely contain peppermint, like toothpaste, mouthwash, cough syrup, chewing gum, shampoo, and of course, soap! Peppermint is also widely used in the tobacco industry for flavoring, and also because of its menthol content. 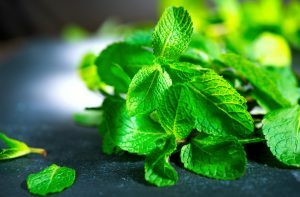 The menthol in peppermint oil lends the cooling sensation desired in cigars and cigarettes, as well as chewing tobacco. Candy canes and other popular holiday candies typically contain peppermint as well. Peppermint’s historical use as a medicinal herb may have faded in the modern medicine practices of the 21st century, but it remains just as popular as ever. Its refreshing and cheerful scent are still associated with cleanliness and festivity; something that has not changed since our ancestors used it to adorn themselves at their feasts and banquets. So, the next time you pop a piece of peppermint chewing gum into your mouth or craft a particularly lovely peppermint scented soap or lotion, take a moment to remember that you are continuing a legacy thousands of years in the making; the love for peppermint! We hope you’ve enjoyed this edition of Common Scents! Leave us a comment below if you use peppermint in your soaps and cosmetics; we’d love to hear what you blend it with, and what products you love to make with it!